With the high rate of school absenteeism due to student illnesses, preventing the spread of germs and viruses depends heavily on maintaining a clean school environment. Cold and flu viruses can live on surfaces up to 48 hours, so having common areas routinely disinfected is of major importance. 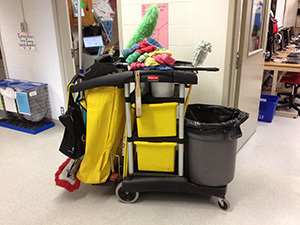 MTO Janitorial, school cleaning service in Prescott, offers these suggestions to maintain a healthy school environment, and in turn, lead to higher student success. Ability to Focus: Healthy students are better able to perform at school because they experience less absenteeism. A school that keeps its facility clean reduces the spread of germ-causing colds and flus, and reduces absenteeism. Less interruptions during the school year mean more continuous learning time. Air Quality: Air quality plays a major role in concentration and attention span. A recent study found that students with better ventilated classrooms scored around 15 percent higher than those in poorly ventilated classrooms. Asthma is also triggered by poor air quality, and is one of the leading causes of absenteeism. Teacher Health: When teachers are absent due to illness, the students are less likely to stay on track with their studies. Having interruptions in the curriculum due to teacher absenteeism can have a negative impact on the quality of education. In addition, people are generally happier and more productive in a clean work environment. Cost to Districts: Teacher absenteeism impacts the bottom line. Funds earmarked for educational resources can be seriously decreased by the need to pay for substitute teachers. The student dropout rate is directly related to absenteeism as well. Thus, a clean school can decrease absenteeism among students and teachers, and lead to higher graduation rate and a better school ranking. We all want our children to have a healthier and more successful educational experience. To learn more about our reliable, quality commercial cleaning in Prescott, and get a free quote, call MTO Janitorial at 928-772-0004.